Hydraulic Bars & Coin stamping machines (Fully Automatic & Eject Function equipped with electronic programmble controller PLC Monitor with Auto Ejector for easy removal of finished coin with built in safety feature. Manual Option also available. HK Malvi Industries Makes Complete unit for Gold Coin Making Units. 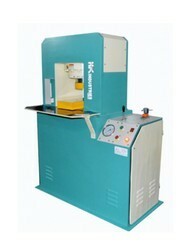 The Hydraulic manual press Comes with multiple features provided with hand lever operating in hassle free way. Designed in well fit form provides less usage space and noise free operations having standardized Hydraulic engineering. The Press Comes with different capacity tonnage from 50 ton to 350 ton according to the working and capacity requirements. Idle for Gold & Silver applicaton ( Coins,Bars,Bangles,Pendant..etc) in various sizes with easy displacement of embossing Dies. Embossing Capacity 250 To 300 minting production per hour.